It was inevitable that major OEMs would try to beat startup Dropcam at their own game, by providing inexpensive, HD IP camera for home security enthusiasts, people with babies and folks who just in general like to watch. Samsung has a few entrants in this category, and the SmartCam HD Pro is their most recent offering. The camera is very capable, and will meet the needs of most, but it does so in a barebones way that can be frustrating to set up and that lacks the charm of its upstart competitor. Once set up, the SmartCam HD behaves exactly like you’d want it to, capturing high-quality HD video with low latency even when used in wireless mode. Its mobile apps offer a lot of handy functions in a clean, easy-to-use interface, letting you capture video or still images, and chat back and forth with anyone on the other end of the camera easily. Motion or audio can be set to trigger notifications on your device, or record clips to an SD card installed onboard in just a few taps. The “once set up” is crucial, though. I found getting the device ready for action to be quite frustrating, considering that I assumed based on the included instructions there was a way to get it working from a mobile device using no other hardware. If you have a WPS-enabled router, you can, but for my Airport Extreme, it required plugging it in with Ethernet and setting it up that way. I also needed to use the web-based dashboard and install (and authorize) a plugin to get it working, since confusing instructions written in bad English made it incredibly difficult to figure out the password creation requirements on mobile. Overall, the software and backend aspects of the SmartCam seem hastily ported for an English-speaking market, and it shows. Once you’ve created your account and are online, it’s only a minor annoyance, but I still would’ve liked to see more attention paid to the UI/UX, especially given that with a product like this, that’s going to be the big appeal for a consumer audience vs. more commercial-focused gear. Dropcam definitely has the advantage on polish and quality of software and hardware experience, but Samsung’s offering does everything you need a home security camera to do. It stores video recordings via a built-in SD card, which saves you the Dropcam subscription fee, but on the other hand it means no offsite storage for your recordings. Which you prefer depends on your needs. 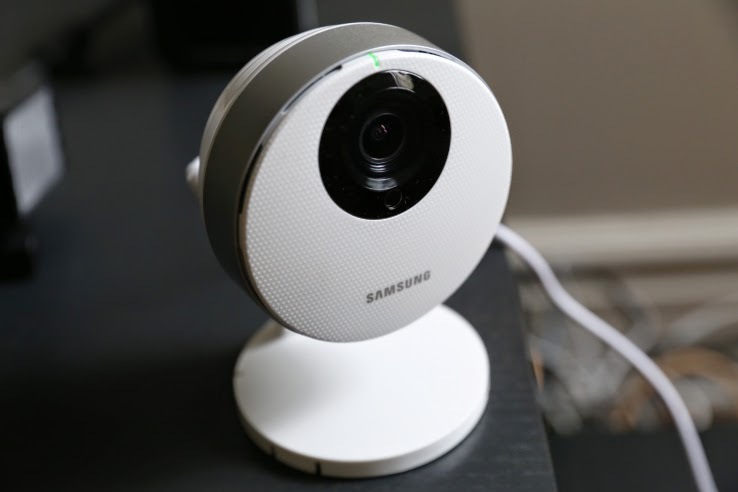 Samsung’s camera is modern-looking, with a circular face dressed in white that’s more likely to blend into white-walled surroundings than the Dropcam competition. But it’s also made of decidedly cheap-feeling plastic, and bordered by a faux-metal band that’s not doing it any favors. But this is not a gadget designed to woo with its looks anyway. Its size is a little much for its function, given that it might make it easier for thieves to spot, and then steal or disable, but it also means it has room for the onboard storage. The mounting foot and hardware it comes with also makes it easy to use it either standing on a flat surface or attached to a wall and angled where you want it to point, both of which are important in this kind of utilitarian gadget. Samsung has delivered a capable piece of kit with the SmartCam HD which works well once you get past the slightly onerous setup process. We already done the research and spend a lot of time for you. Click here to find out where to get the best deal on Samsung SmartCam HD.